We often hear about consumers shifting from traditional segments to SUVs. This is because SUVs are becoming increasingly luxurious whilst also more affordable, which appeals to more people around the world. Part of this “evolution” also includes different kinds of car body-types, like sedans, hatchbacks or station wagons. The latest data from JATO Dynamics shows a clear trend towards these cars, which does not seem to be slowing down. 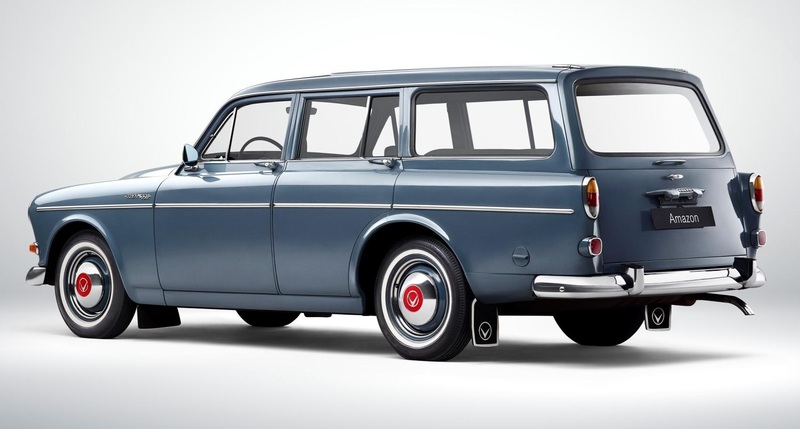 With the exception of Italy, where they are considered cool, station wagons are intended for family use due to their versatility and greater cargo room. This is how they gained traction decades ago when big families looked for something more comfortable than the traditional sedans or hatchbacks. Functionality and purpose drove station wagon sales more than emotion. This is an important thing to consider, as consumers have become more rational when buying cars. However, becoming more rational doesn’t necessarily mean becoming less emotional. This is true for SUVs, which offer the same versatility and cargo room as station wagons, but with the addition of appealing design. 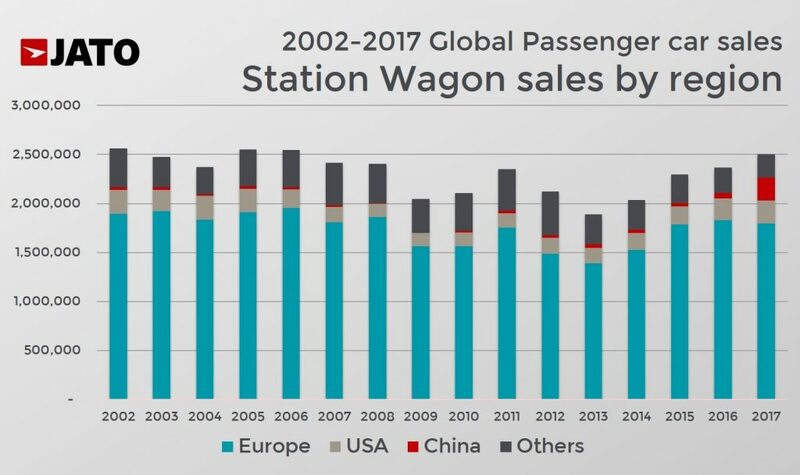 This explains the fall in global demand for station wagons during recent years. They are a rarity on the streets of China or the USA and are not even available in many Latin American markets. Europe remains their biggest market. Last year, consumers around the world bought 2.5 million station wagons. That is the equivalent of 3.1% of total passenger car sales in the 53 markets covered by JATO. Their market share was lower than the results seen at the beginning of this century. 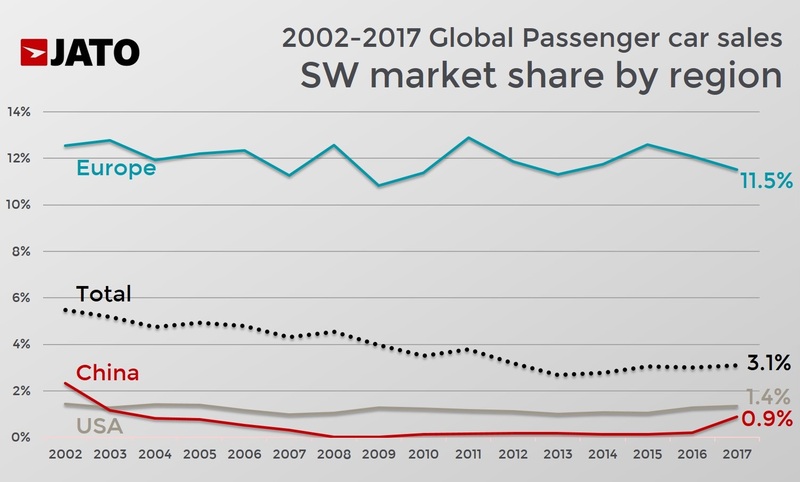 In 2002, when SUVs were still a minor player in the industry, station wagons accounted for 5.5% of global passenger cars sales. While global passenger car sales grew by 72% between 2002 and 2017, demand for station wagons remained stable at around 2.5 million units. 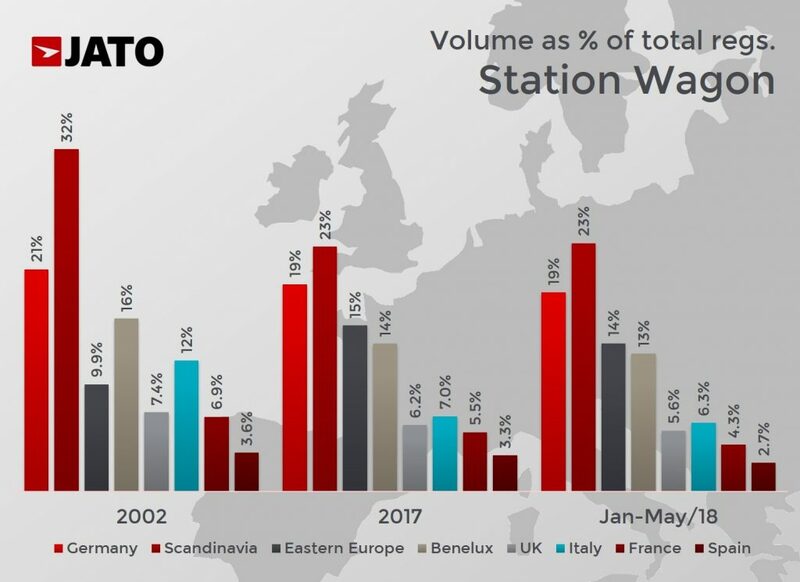 European sales make up the biggest part of station wagon global demand. 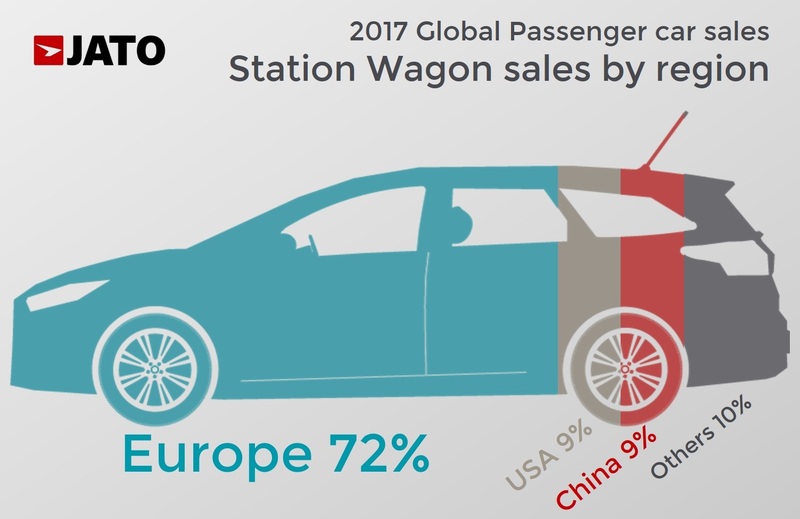 Last year, 72% of station wagons sold in the world remained on European roads. 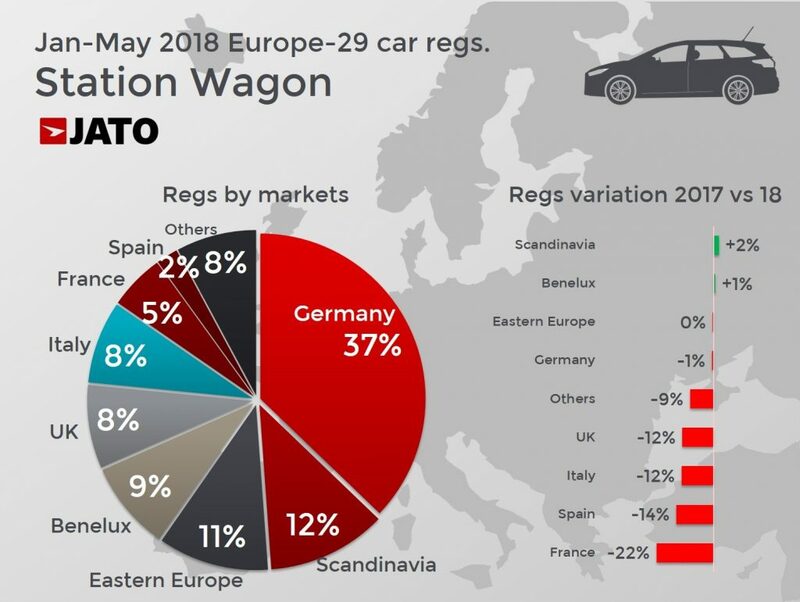 Although they have lost some share during the last 15 years, station wagons have generally managed to handle the SUV invasion well thanks to their strong position in Scandinavia (where they represent 23% of total registrations) and Germany, Europe’s biggest market. The biggest drop has taken place in Italy, where their market share dropped from a peak of 14.6% in 1999 to 7.0% last year. Outside of Europe, station wagons fare very differently. Consumers in the USA have never been fans, with the historical marginal market share at around 1 in 100 vehicles. Hatchbacks and station wagons have never grabbed the attention of America. In the past, the sedan led the way in the USA, while nowadays it’s SUVs and trucks. Station wagons are even less popular in China where their market share hasn’t surpassed the 1% mark, with compact sedans and SUVs the clear market leaders. 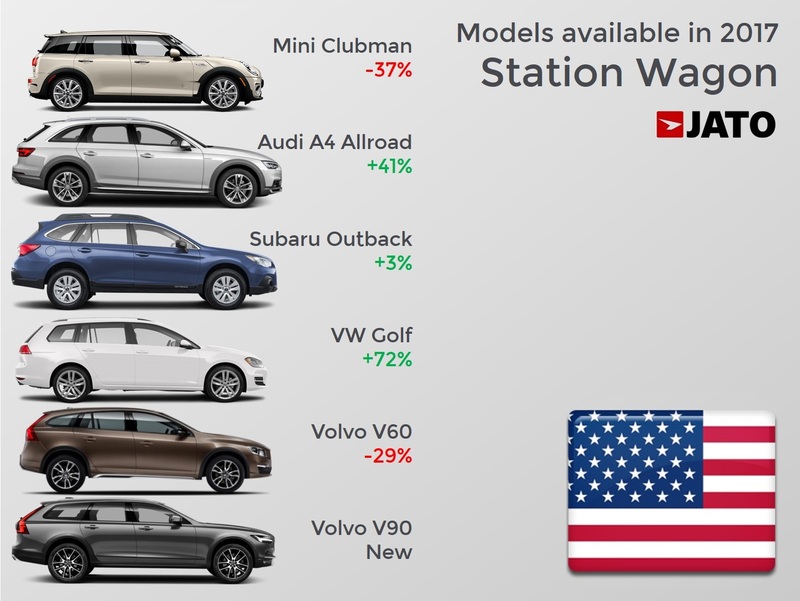 Although the trend shows a decline, there is also good news for station wagons. 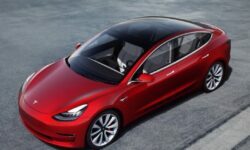 Last year, they posted the highest sales volume since 2006 with sales up by 5.7% compared to 2016. The reason for these strong results is China, where it seems that station wagons are gaining some traction. 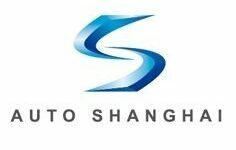 Although they accounted for only 0.9% of total sales in China in 2017, they registered a strong growth of 329% to a record of 232,400 units. In contrast, volume fell by 1.8% in Europe. What drove this growth in China last year? 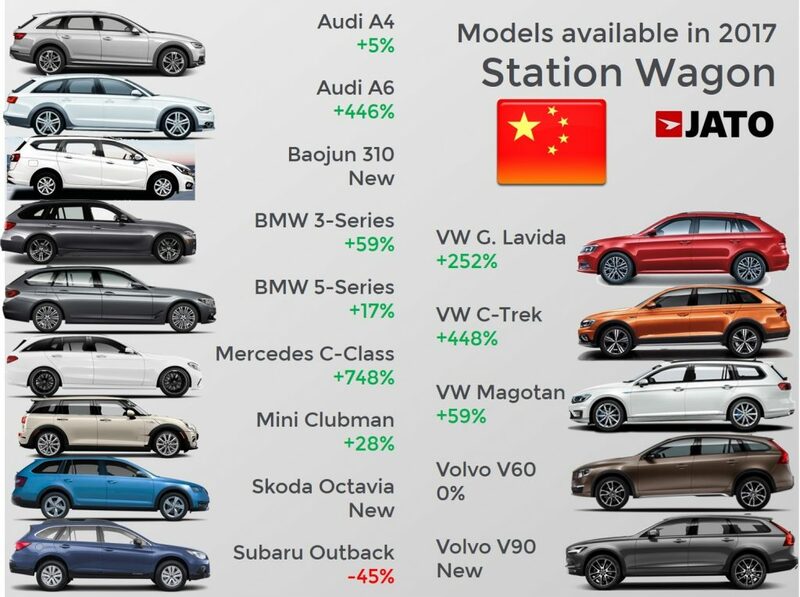 The market has seen the arrival of new models like the Volkswagen C-Trek and Baojun 310 Wagon, along with the introduction of the station wagon versions of the Skoda Octavia and Mercedes C-Class. Following the introduction of the Cross Country line of Volvo and the Allroad line at Audi, Volkswagen has successfully introduced SUV design features in its compact station wagon C-Trek in order to increase its appeal. This year Buick added the station wagon version to the popular Excelle, meaning that the big players are now pointing at this segment by adding SUV design features to regular station wagon body-types. Could there be hope yet?